Contains episodes 12-22 plus the original soundtrack CD vol. 2 by Masaru Yokoyama, collectible post cards. Due to licensing and contract restrictions, this product can be sold and shipped to the US, Canada, Central America, and South America only. It cannot be shipped to Japan. All sales are final. It may be returned for an exchange if defective, but unfortunately we are unable to offer refunds. Great show, well executed, with an ending that is one of the most emotionally charged I’ve seen in a long, long time. Audio is LPCM stereo in Japanese/English, with optional English subtitles. Japanese/English voice work is well done and carries decent emotion. I viewed in Japanese and spot checked English. Video quality is impeccable, as it should be for a show at this price. Price is the biggest complaint. Aniplex has dubbed it, a show in a genre historically not critically received and shown on TV stations. They’ve passed the expense to the consumer in a BIG way. Overall, Aniplex has provided a release that is worthy of a title of this caliber. It is unfortunate that many are likely to skip it due to the price, but it really deserves to be seen and enjoyed. Japanese Blu Ray quality, with a price to match. Ok so the price is a little high and alot don't come with it unlike other sets I have bought in the past but I will say it's still worth it in my book, really great anime and loved it. Came fast and they even shipped it a few days before it was released. Great series no question about it but is it worth 130 bucks? (260$ counting both sets) Hmm... the boxset itself is really flimsy(practically paper thin) so thats really disappointing, its like the Kill La Kill LE releases so disappointing.. On the bright side it has beautiful artwork all over it, the disk cases & disks themselves. Its pretty bare bones in terms of goodies, especially for the price. Your getting 3 really nice art cards and a CD. What it comes down to is how badly you want to own the series, its expensive & basically not worth it unless you really want to own it. A final note to what is sure to be an Anime Classic for years to come! 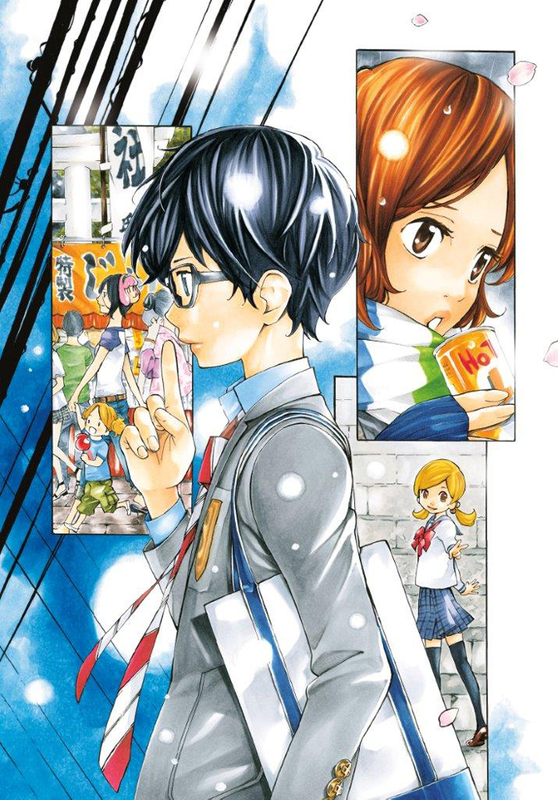 Part 2 of Your Lie in April is the meat of the series. While part 1 is fantastic, it's really mostly just setup for the second half. It's an emotional journey and the roller coaster doesn't stop the whole way through. I felt all plot lines had satisfying conclusions and overall was pretty happy with where the characters ended up. Their struggles and their responses to them seemed realistic to me. All and all this is one of the best slice of life anime I've ever seen. I watched it on Netflix and knew I had to own it. It really is just that good. A-1 Pictures did such a great job animating this series, it is nice to have a good English dub in order to soak in every second. The episodes aren't all crammed onto one disk so as not to loose any video quality. I love the artwork on the box, it matches nicely with the first one and the bonuses are great to have. Both the soundtrack from set one and this set only contain the original songs, but I'm sure I'm not the only one who would like to have the performance pieces too, though. I'm still happy with everything. Can't wait for more from Aniplex. By the time your finished with this series, you need to use fake tears for emotional series such as Your Lie in April. Definitely not recommended for those going through depression. This won't do you any good. Although it is a fantastic show, wait until your prepared to board the feels train. It's one bumpy ride you'll never forget. The second half of Your Lie in April elevates the previously established drama and continues to build up leading to a conclusion that'll bring a tear to those who are fully invested. If you enjoyed the first half, it's safe to assume that you'll enjoy the second half as well. The only main complaint I have is the pacing. It slows down and begins to draw things out a bit too long, the plot also shifts focus away from some characters who really could have used it to flesh out their story. Overall though, it's a great conclusion to a series that has continued to build hype. I don't believe the show to be a masterpiece, but it is one that'll be remembered for years to come. The packaging is similar to that of the first set. It's a lot of money to cough up, but it was a purchase I don't regret in the slightest. If you're a fan of the show and have the money, it's worth it. Part 2 is even better than part 1 with even more beautiful animation and music and if you can afford it is definitely worth the price. When I began watching this anime, I knew it was going to be heart wrenching but beautiful. I was definitely right. The animation and effort put into making this show is stunning. The box set itself doesn't come with too much, but it was worth the price to me because of how much I adore the show. The characters are so easy to get attached to and root for in everything they do. It is an emotional roller coaster all the way through, but beautifully executed in a visual, musical, and scripted way. I really related to the show, and I love classical music/playing instruments. It is in my top 5 anime I have seen now. Definitely recommend watching it. If you're looking at this Set you've probably already set your mind to buying the first one. If you have, then it's basically what you'd expect. This box set is exactly like the first one, though containing the second half of the anime, second soundtrack, and some different collectable postcards. The reasons you should buy this are... 1: you get the second sound track along with the second half of the anime 2: that you get to have a gorgeous box to instead of a bunch of boxes (which while also pretty take up more space). The final box of the anime from AOA. Me personally I love the artwork on the boxset on how it also goes with the first boxset and that it comes with the soundtrack. The anime itself is very good and is a tear jerker that definitely deserves to be on your shelf. A great musical anime that pulls at your heartstrings. I enjoyed this anime there was a couple times I wanted to cry due to some emotional moments mostly the end. The story and music blend perfectly to make this a great experience to watch. I liked the main characters, and you just hope the whole time that Kousei can get through his past and play the piano once more. I give this anime an 8/10 for the music, story, and characters who bring it all to life.